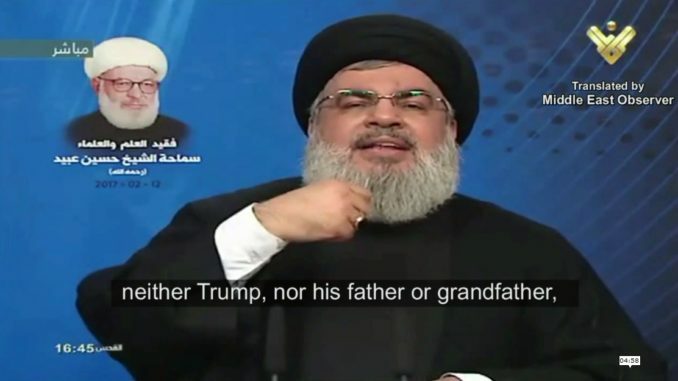 Hezbollah leader Sayyed Hasan Nasrallah thanked the ‘foolish’ US President Donald Trump for revealing the ‘ugly face of the US administration’. During a ceremony held in northeast Lebanon to commemorate the late Sheikh Hussein Obeid, a former founding member of Hezbollah, Nasrallah said that his party had no ‘fear’ of a Trump presidency, in light of recent media reports to the contrary. To all those who said and wrote in the past few weeks – I saw many articles that said Hezbollah is worried, terrified, scared. Why do you say this – what’s up? Well because Trump came. And so what if Trump came? What’s new? What’s new is just like what his eminence the leader Imam Sayyed (Ali) Khamenei) said – may God prolong his life – what’s new is that before (Trump) there was someone who had placed on his face a cover of hypocrisy – a cover of hypocrisy, in that he speaks nice words to you, he congratulates you on your (Eid) holidays, but what (else) does he do? He places sanctions on you, and he launches war on you throughout the world, and he kills thousands of civilians with his air strikes, and he supports and embroils himself in wars like the Yemen war which killed, injured, starved and besieged hundreds of thousands, and he supports dictatorial regimes such as the ones in Bahrain, Saudi Arabia, and others, and he does everything…and he produces Daesh (ISIS) for you, so that it brings disgrace to your religion, and to your Prophet, and your Quran, and to spill your blood, and take your women as prisoners, and destroy your societies and states, but he does so while smiling, and you have sympathy for him because he is of the black colour. Now what is new – and which is a good thing – is that someone came and put hypocrisy aside, and for this reason his eminence the leader Imam (Ali Khamenei) said that we must thank Trump because he revealed once again the true face of the US administration, which is racist, ugly, criminal, murderous, that spills blood, confiscates freedoms, that steals the wealth (of other nations), that plots against the oppressed people (of the world). Thank you. We are not upset, we are thankful to Trump, because from the moment he came – this is the reality of the US administration, so that nations – which had begun to get lost, misled, and confused once again – (could see). As for the idea of fear, this was put to bed long time ago. To all those who write, give speeches, think, and analyse, I say to them, (while having in mind) the old age of (the late) Sheikh Hussein Obeid, one of the leading nine (personalities) that founded Hezbollah in 1982: we were present in 1982, now we are in 2017. In 1982 we were a small, faithful, oppressed number (of people), who feared that we would be overrun by the people around us. The Israeli army which was ‘undefeatable’ was occupying (at that time) half of Lebanon, 100,000 Israeli soldiers and officers in Lebanon, 25,000 American, French, British, and Italian soldiers and officers in Lebanon, add to that internal Lebanese problems, and the fleets – New Jersey and others – were stationed in the sea, and we were a small number – us and the remaining people within the resistance, other movements and parties – and we did not get scared, nor did we become worried, nor did we waver, and we had full belief in our path. This victory became a reality in 1985, and in (the year) 2000, and in 2006, and it is becoming a reality in Syria, and in Iraq, and it will occur in Yemen God willing, neither Trump, nor his father or grandfather, and neither George Bush, nor his father or grandfather, nor all of these racists, are able to affect the courage, willpower, certainty, or faith of even one of our children, let alone our men and elders. For this reason, we are not worried, rather, we are very optimistic, because when a fool resides in the White House, one who (displays) openly his foolishness, (then) this is (an indication) that relief has begun for the world’s oppressed.